Take your favorite car care products (McKee’s 37, of course!) 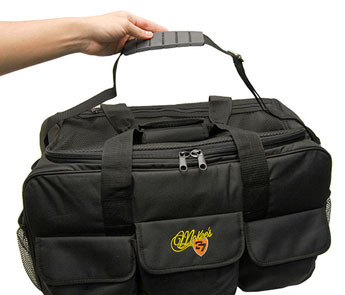 with you every where you go with the McKee’s 37 Professional Detail Bag! This cavernous bag easily swallows every imaginable cleaner, wax, polisher or detail brush that you need for mobile detailing. The plethora of Velcro and mesh pockets keeps everything nice and tidy, and the convenient shoulder strap makes carrying the bag a breeze! The McKee’s 37 Professional Detail Bag is constructed using super durable 600 denier nylon canvas that also happens to be water resistant! There’s a place inside this bag for ALL of your supplies! If you find it difficult to transport all of your detailing supplies from job to job, then join the club! 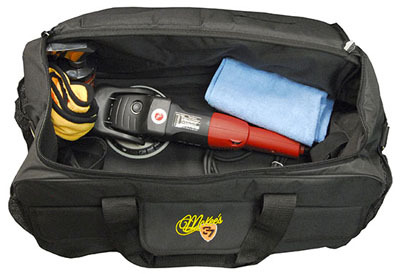 Do without the hassle and carry all your detailing supplies including polishers, vacuums, pads, and more in the McKee’s 37 Professional Detail Bag! 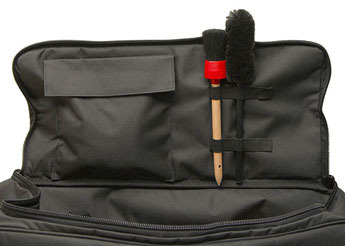 The McKee’s 37 Professional Detail Bag was designed by detailers, for detailers! This well-constructed bag features a host of pockets and cubbies to keep your supplies neatly organized. Inside the bag you’ll even find loop straps for extension cords and a hidden pocket for masking tape.